General Intelligence: I'd say above average? She's literate. Long Term Goals: Learn magic! General Wealth: Who wants to know? Eating Habits: She likes meat! And seafood, and everything really! Exercise Habits: She stays lean and as strong as that can afford her. Birthplace: A lovely little collective in a forest, as the firstborn her parents figured out what was needed though she definitely had her dad's eyes. 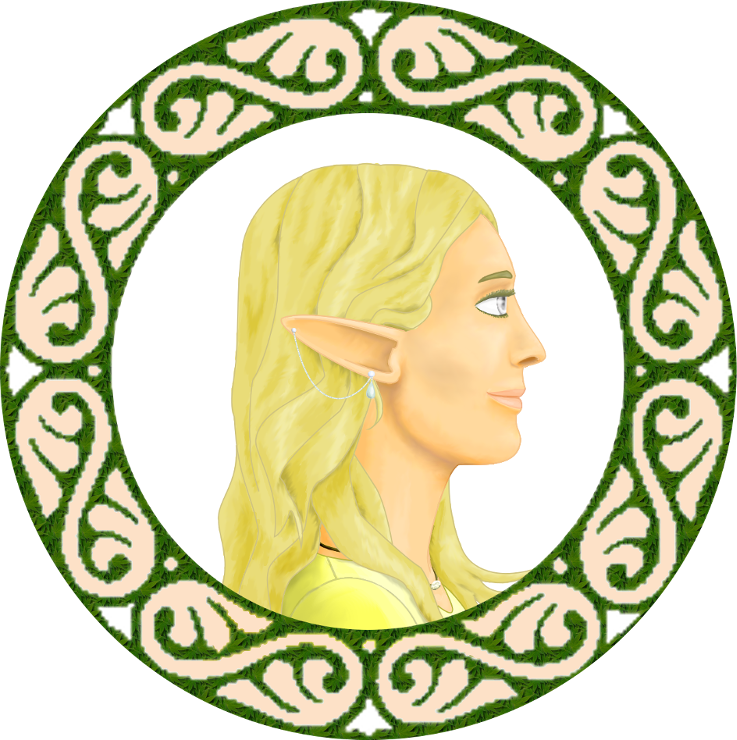 Childhood: Tae grew up active as all forest elf children do, Both her parents praised the great Hunt which she would have likely done as well if she hadn't felt more attuned to the All Mother. With little more than a feeling that this was her calling; Tae perused any adult for information and was fortunate that her home had many learned in the way of Life and Healing. People would remark on her eyes, being an unusual grey color that bordered on silver when the light was right. It was speculated she'd be a stunning beauty as she grew much as her mother was. Teen Years: When her little sister was Born Tae was already tending the livestock her clan raised to them healthy and was tutoring under the old doctor to begin her path towards being a proper healer. Ellothil was a squealing pale lump that scarred the rabbits but Tae doted upon her sister. Just starting to bud the hopes of the young men of her village for her being like her mother grew. It was at this time she heard of the Sisterhood, what they did, and the miracles they still practiced. While she didn't aspire to join the Sisters she held them in high regard and hoped to be worthy of her goddess as she grew. Adulthood: Approaching this time of her life it was clear Tae was doomed to be a plain woman unlike her sister who was a far prettier child than her older sister had been. Following certain events she set off to get more training than she could at home and vowed she'd return a proper doctor and mage to help her people through the hard times. 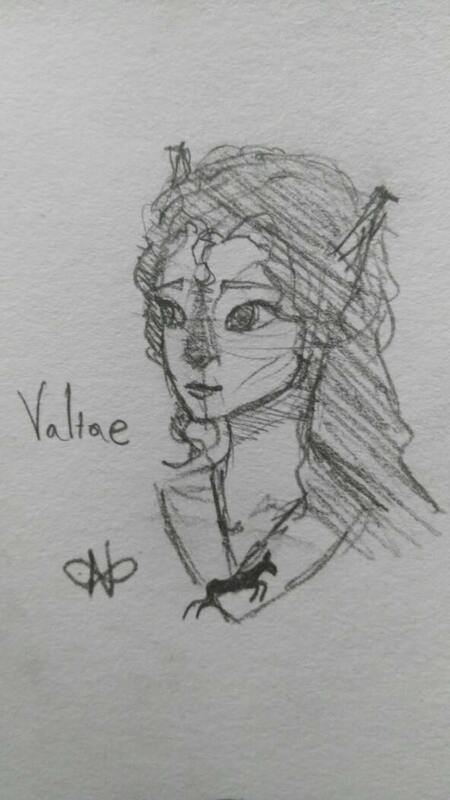 With this plague running rampant, Valtae thinks of home often, wondering if her sisters caught the sickness and wishing she was more useful to the efforts to find a cure. As of now though she feels like more of a burden to those efforts than anything and longs to return to Astrum to help Rai with pregnancy pains and worries. Places Traveled: Various large cities in the Southern part of the continent. Combat Training: Has some basic archery training. Knows which end of a dagger is the business end, which bones can be broken without causing fatal harm and where to hit to cripple attackers with pain. Favorite Types of Food: Clam Chowder (Recently the smell and taste of it puts her off), all things spicy! Elwin: My Dove, I'd take you as my own if the world was more at peace. I can't believe you've gone through so much, so young. I want to protect you. Jhearos: One of Fronslins friends and someone she feels comfortable around. Chaeyra: Frosnlin's adopted Daughter. You left so suddenly, I guess being with your grandparents is better than living with perfect strangers. I hope you are safe.you. Rowaldin: the Astrum Herbalist. he's sweet, gentle and their lines of work means they constantly have interactions above and beyond her checking with the residents to be sure everyone in good health. She hopes his plans to create new types of flowers through plant husbandry comes to fruition. Frost: Pretty cute for a human and a surgeon! The Lords of Blackstone: At it again I see... it seems you cannot escape judgement this time though. i remembered to add you to relations right? and waoowwww what? that tae finally has art? Trying to do thenign to character name thing. If yall could pm me if i dont habe you mentioned properly that would be super awesome! Drew n his goat babies? I asked his permissin to use his work no worries. Artists gotta stick together against art thieves! Some dditiosn given recent events.